Cartwright Conversions has delivered the final ambulances to E-zec Medical in a deal with the private ambulance company to supply more than 100 patient transport vehicles. The Yorkshire-based company specialises in vehicle conversions for the healthcare industry including frontline ambulances, patient transport service (PTS) vehicles and wheelchair accessible vehicles. 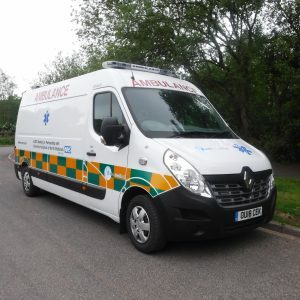 E-zec Medical is one of the largest independent private ambulance companies in the UK with a fleet of more than 400 vehicles and 20 bases across the country. Cartwright won the contract earlier in the year to build the Fiat Ducato PTS vehicles and Renault Trafic wheelchair accessible vehicles. It was followed-up with an order for a further seven high dependency units on a Renault Master panel van. Designed by Cartwright’s team of experienced in-house engineers, these vehicles will be used by E-zec on two new NHS contracts covering Suffolk and Staffordshire. The seated PTS vehicles are fitted with a ramp and have fold-away seats on the nearside to make room for two wheelchair passengers. A storage pen and aluminium cant rail lockers make efficient use of the space inside the vehicle and its easy wipe-down lining ensures infection control. In addition, Cartwright’s engineers designed an alternative version for E-zec with a stretcher in place of two offside seats. Both versions are fitted with piped oxygen for the comfort of patients that need it. The high dependency vehicles have a trauma wall and a full emergency warning system. E-zec specialises in contracts that involve some form of high dependency work using fully-equipped ambulances operated by a paramedic crew. The Renault Trafic wheelchair accessible vehicle (WAV) supplied to E-Zec is part of a range of WAVs available from Cartwright on the national Motability Scheme.